Why GreensPlease? - GreensPlease. Whole Food Green Smoothies. 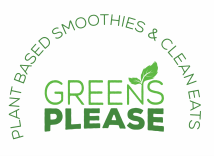 We are green smoothie advocates! We feel extremely blessed to provide San Diego with delicious healing smoothies. We're so grateful to have the opportunity to support local organic farms, and we want to encourage you to drink green smoothies as often as possible. And don't forget to do your produce shopping at local farmers markets. Blending keeps the smoothie a whole food. All that very important fiber from the produce is in every sip (it's nice and pulpy!). The greens we use are well known for their cleansing and detoxifying properties. Fiber acts as a binding vehicle to move toxins out of your body - reducing or eliminating detox headaches. In this way, blending is more natural than juicing; the fiber which naturally occurs in greens and fruit is an extremely important part of the whole food. REDUCE THE TOXIC LOAD: KEEP CHEMICALS OUT OF THE AIR, WATER, SOIL & OUR BODIES. Buying organic food promotes a less toxic environment for all living things. It should go without saying, the less poison we ingest the better. Not poisoning the native wild flora, fauna, and terra is a sweet by product of living, natural and healthy. TASTE BETTER & TRUE FLAVOR. Scientists now know what we eaters have known all along: organic food often tastes better. It makes sense that strawberries taste yummier when raised in harmony with nature, but researchers at Washington State University have proven this as fact in lab taste trials where the organic berries were consistently judged as sweeter. Plus, new research verifies that some organic produce is often lower in nitrates and higher in antioxidants than conventional food. ORGANIC PRODUCE GROWN UNDER NATURAL CIRCUMSTANCES CONTAINS MORE NUTRITION. ASSIST FAMILY FARMERS OF ALL SIZES. According to Organic Farming Research Foundation, as of 2006 there are approximately 10,000 certified organic producers in the United States compared to 2,500-3,000 tracked in 1994. Measured against the two million farms estimated in the United States, organic is still a tiny segment. Family farms that are certified organic have a double economic benefit: they are profitable and they farm in harmony with their surrounding environment. Whether the farm is a 4-acre orchard, or a 4,000-acre wheat farm, organic is a beneficial practice that is genuinely family friendly. Getting your nutrition from raw living foods is the most natural way to do it. You instinctively know that a tall glass of green smoothie is incredibly good for you. The reason: we were designed to get our vitamins and minerals from food, not pills made in factories. The chemical makeup of multi vitamins and fortifiers are not always recognized by your body as actual nutrition, and are often just filtered by your kidneys and eliminated in your urine. The bio available nutrients in fresh produce are easily assimilated and immediately put to use by your body with zero stress on your already over worked eliminating organs (Kidneys, liver, digestive system etc.). "It's not how many milligrams you take, it's how much you assimilate that makes the difference"